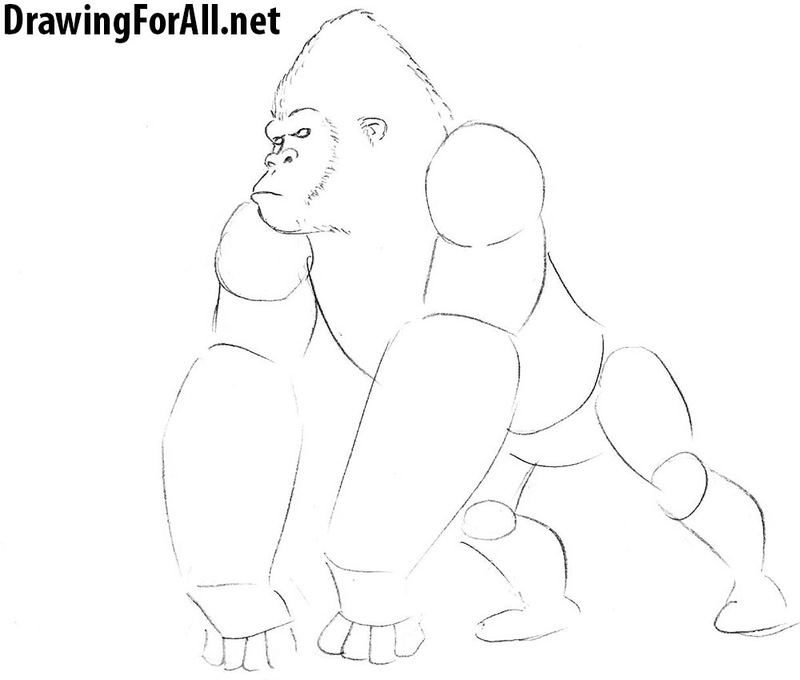 Hello dear artists and welcome to the tutorial on how to draw King Kong! King Kong is a giant ape monster, popular character of mass culture. King Kong is a giant ape monster, popular character of mass culture. Coined by the American writer and director Merianom Cooper. For the first time presented to the public in the eponymous film in 1933. Image of King Kong used in a variety of movies, TV series, books, comics, games and other products, and his role in these products of popular culture ranges from rampaging monster to tragic antihero. As we know man evolved from apes, and therefore their skeletons are very similar to each other. 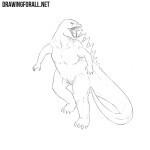 So draw the head of our King Kong in a shape of a circle. Move down and draw the torso and pelvis. Sketch out the spine, arms and legs. , so we have to add a lot of volume to his skeleton. First sketch out the facial lines and snout. 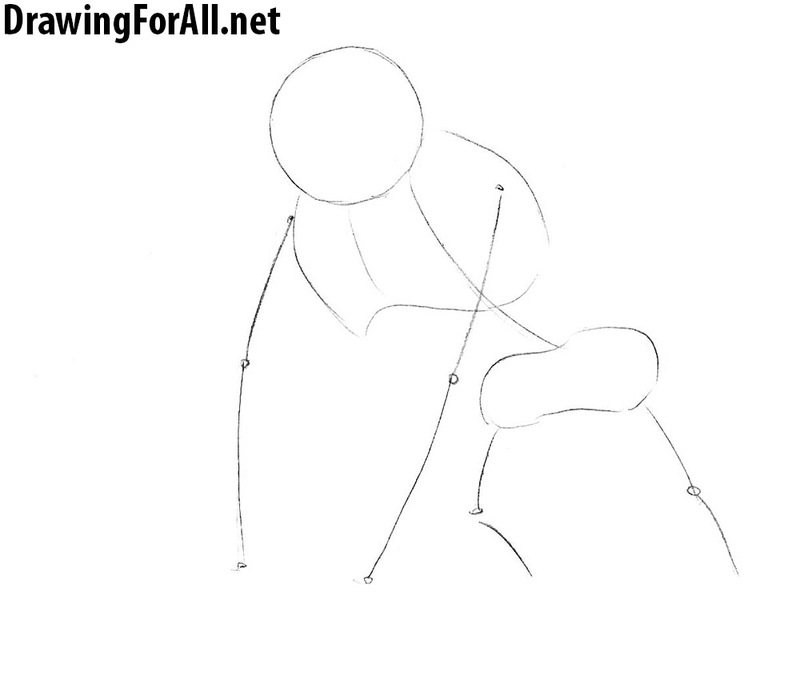 Then draw the shoulders in the shapes of circles and arms. 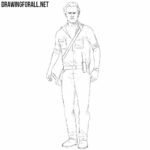 Next draw the torso and legs. 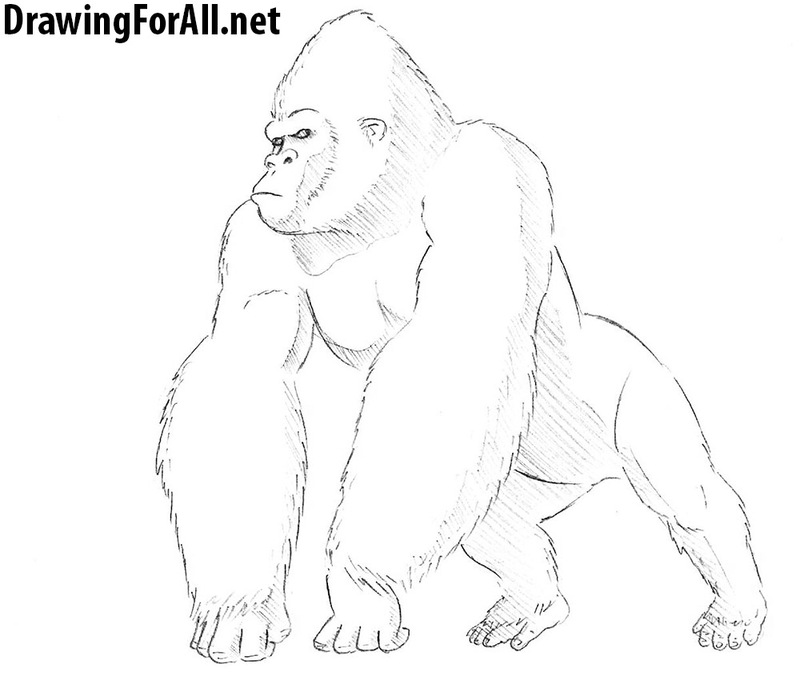 Note that the arms of all the gorillas including King Kong look much bigger than their legs. Draw out the eyes that located right on the eye line. Above the eyes draw the massive eyebrows. Draw the nose with wide nostrils which is very close to the eyes. And at the end of this step, draw the mouth. 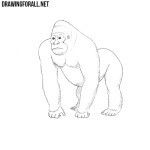 Carefully draw out all the lines on the head of our giant gorilla. Using short and close to each other strokes draw the texture of hair on the head. Draw a small ear and erase all extra lines. We are slowly approaching the end of a lesson on how to draw a King Kong. Using short strokes draw out the texture of hair on the arms of King Kong. 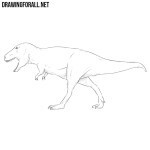 Carefully draw the fingers, which are very similar to human. Also sketch out lines of the pectorals. 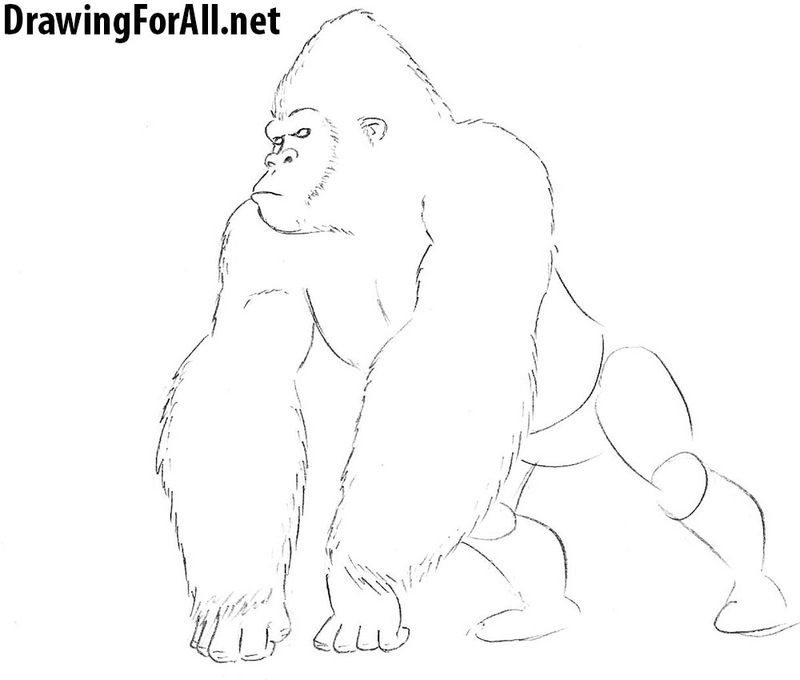 Here we are doing almost the same actions that in the last step – draw out the legs of King Kong, use short strokes to draw the hair, erase the guidelines. And at the end of the step we draw the fingers which are also similar to the fingers of the human hand. Here we will add very light and unobtrusive shadows. We have already described the technique in other articles, but repeat again – first using very light lines draw the outlines of the shadows, and then paint over them with the help of light and even hatching. By the way King Kong first appeared in the eponymous film in 1933 and became one of the most recognizable monsters of the twentieth century. Strangely enough this story is very similar to the story of the Beauty and and the Beast, where a very terrible at first glance the creature falls in love with a beautiful girl. We will be happy like King Kong who received a mountain of bananas if you share this lesson and subscribe to our updates on social networks. By the way King Kong was also the prototype of Donkey Kong – one of the main characters in the eponymous game. What is your favorite movie, game, book or cartoon about King Kong? Write it in the comments below! This sight is the best!!!!!!! !